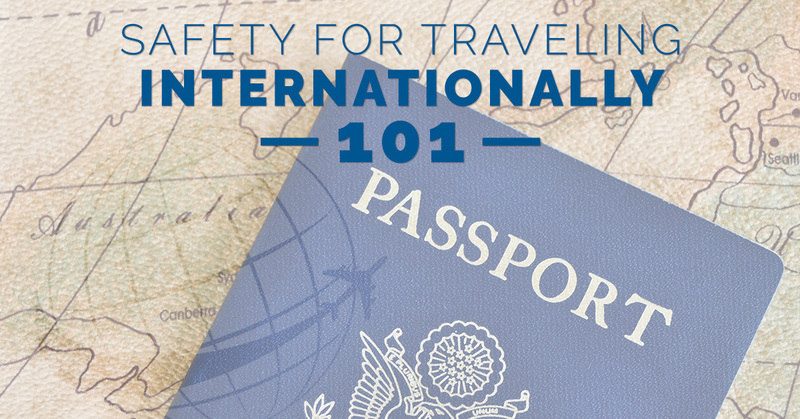 Traveling abroad, especially the first time, can cause a lot of internal anxiety when it comes to thinking about your safety. With the media constantly reporting on attacks in various places around the world, we can understand any trepidation you may have about booking your trip to Israel in order to see the Holy Land. But fear not, there is no greater risk to yourself than if you were to walk out your front door if you travel smart. Just like you learn how to properly protect yourself in your community from theft or other harm, the same is true when you travel. Visiting Jerusalem is akin to visiting any other big city around the world. So, as you’re getting ready to book your tours of Israel with World Express Travel, keep the following international travel safety tips in mind for your trip. One of the best things you can do to put your safety first is to stay informed. Utilize not the news media, but a variety of government travel websites in order to keep a lid on what’s going on in your destination area. For Americans getting ready to travel, check out the U.S. Department of State Travel Warnings prior to booking. However, make sure to thoroughly read the warning for any country in order to fully understand where the warning covers. For example, travel in the West Bank isn’t recommended due to Hamas activity, but Jerusalem and northern areas in Israel, such as Tel Aviv are quite safe to visit. In addition to staying informed, it’s important to not go looking for trouble. This means that you should avoid high-conflict areas that are known to have problems. This shouldn’t completely rule out any visits to Palestinian areas, such as the West Bank and the Dead Sea, but you just need to use caution. In fact, many of these areas are quite nice to visit (make sure you have your passport for border crossings), however, there have been times of conflict escalation. Once again, just stay informed about your destination areas. Whenever you travel, no matter where you travel out of your own country, always carry both destination currency and USD. USD holds a lot of weight around the globe and many places will accept it. However, you want to use local currency, which in Israel is the Israeli Shekel, whenever possible. Most countries will ONLY accept local currency and coming prepared will help you to avoid high exchange rates or getting yourself into a tricky situation. In the day and age of phones and Google Translate, it’s not as important to carry a local language to English dictionary with you as it once was. However, it is important to make sure that whatever translation app that you prefer can work off network and without wifi. Overseas, the odds are you won’t have phone service and wifi can be hard to come by when you’re trying to get directions on the street. If you can’t find a phone app you like, go the old-fashioned way, and pick up a language dictionary to help you. This recommendation comes from personal experience, but don’t walk around a large, foreign city with your tour book or dictionary out. It is one very clear clue to pickpockets that you’re a foreigner and an easy target. Walk with a purpose and if you have to use a tour book, only open it when you’re safely seated at a restaurant or in a museum. In addition to keeping your tour books securely stowed in your bag, it’s important to really think about the bag you’ll be touring the city with. Outside of the United States, some of the most common problems you may run into is pickpocketing. Whether this means someone reaches into a back pocket to steal a wallet at a busy train station or they slash the bottom of your backpack, pickpocketing doesn’t necessarily put your life in danger, and it can be prevented. Choose a bag to travel with that you can keep at your side over a traditional backpack. This way you can always have one arm draped over it. Also, keep any extraneous cash in a money belt under your clothing. Lastly, never keep a wallet in a back pocket, but opt for front pockets or interior coat pockets for safety. When you pack your suitcase for your trip, do your research. You will want to dress to fit in and not dress to stand out. In Israel, this means modest clothing that covers your legs and shoulders for when you’re touring. Also, don’t opt for t-shirts that have English text on them, but plain colored shirts. You may also find yourself interested in purchasing local clothing, and this can be a great way to fit in and get some great, new clothes. Lastly, whenever you travel abroad, make sure that a close family member or friend has access to your itinerary. You will want to check in with this person before you leave and when you get back just in case. It’s important someone has your travel information. To book your tours of Israel and the Holy Land with experienced tour guides and travel agents, contact the travel specialists at World Express Travel. And as always, travel smart in order to travel safe.